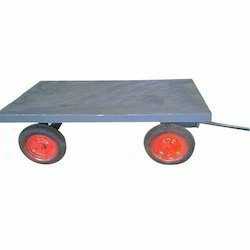 Pioneers in the industry, we offer flatbed trolley from India. We are instrumental in offering high quality Flatbed Trolley to our valuable customers. The offered trolleys are commonly used in construction industry for moving bulk loads of bricks from place to place. Owing to our well-connected distribution network, we deliver these trolleys within the promised time frame to the customers’ end.